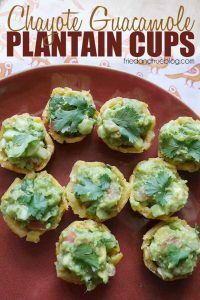 A great Costa Rican influenced appetizer to serve during the World Cup! Remove from oil and sandwich between two plates to flatten. Immediately press in mini cupcake tin to for cup shapes. Allow to cool slightly and fry again in coconut oil for 2 minutes. Season with salt. Chop guacamole ingredients and mix together with a potato masher. Spoon a small amount of guacamole into each cup. Serve and enjoy the game!